Potato and vegetable growers are providing a hugely valuable habitat resource for some increasing populations of solitary bees in the UK, with a novel Green Headland Mix planted around fields of growing crop. Monitoring of Green Headlands around highly productive fields in East Anglia last year has identified huge insect numbers and a vast array of biodiversity. The Green Headland initiative was instigated by Syngenta and ASDA, in association with grower supply group, IPL, and specialist seed suppliers, Kings. Independent ecologist, Paul Lee, assessed over 36,000 invertebrates, collected from sweep netting on six farms on just two occasions over the summer 2018. Some Green Headland margins contained up to 55 different species. Some solitary bee species have been increasing in both number and range across the UK over the past decade, benefitting from the trend to warmer temperatures. “Last year’s record temperatures and prolonged dry conditions were particularly favourable for some solitary bees, and we have seen the numbers increase accordingly,” pointed out Mr Lee. Solitary bees are typically far more efficient as pollinators, compared to honey bees. The hairy bodies of some species can transfer dry pollen between flowers more effectively. Studies have indicated that, as a pollinator, a solitary bee is three times more effective than a honey bee, and typically visits in excess of 100 x more flowers a day. One of the key highlights of the Green Headland monitoring had been repeated sightings of the Squat Furrow Bee – on half of the assessed farms across the region. Classified as nationally scarce, the solitary bee species has been doing well, moving further north and expanding its range. 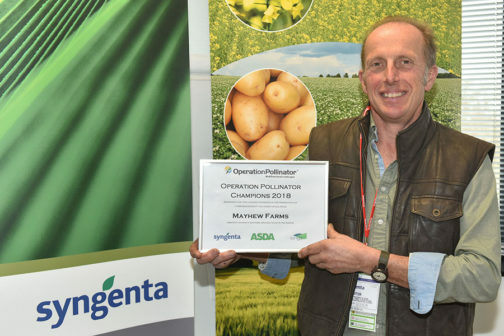 The Squat Furrow Bee was one of the exciting finds on the Suffolk farm of the Geoffrey Mayhew Farms ltd, based at Pond Farm, near Erwarton, Ipswich- winners of the Syngenta Operation Pollinator Green Headlands Biodiversity Award 2018. With between 41 and 55 different species in each of the farm’s Green Headlands assessed, the biodiversity was consistently high. That included a Five Banded Digger Wasp, which is nationally rare and a key target for action to enhance biodiversity, but has a strong foothold in Suffolk. Importantly the wasp can give positive control of crop pests, by hunting and collecting damaging weevils, which it buries and uses as a food source for its young. It was one of a large number of predatory insects identified in the Green Headland margins, which can beneficially help to reduce pest pressure on crops. Geoff Mayhew highlighted that growing the brassica and phacelia rich Green Headland Mix brings a range of benefits to the farm, including plant biomass and rooting to protect and enhance soil structure on the headlands, as well as capturing nutrients and retaining them in the field, where they can be utilised by the following crop. “Environmentally it delivers a real positive boost for the farm and, since we are growing the mix on previously uncropped headland, there is no loss in productivity from then field,” he enthused. “It’s also a great attraction for visitors to the farm. 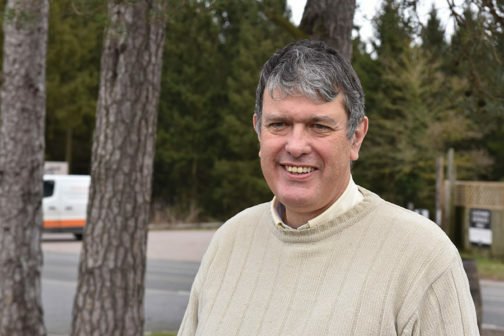 He highlighted the monitoring had identified no major pest species harbouring in the margins, and few aphids that could risk the spread of virus into crops, particularly carrots and potatoes. Dr Newbert reported his studies last year, that where Green Headland mix was planted around carrot fields there was a 70% reduction in visible virus effects, compared to no margin – albeit with a relatively low level in all the crop and a low risk year. He also believed that it could offer a viable Integrated Pest Management (IPM) approach to Carrot Root Fly control, as sampling found no Apiaceaespecies in the Green Headland mix or build-up of Carrot Root Fly. Belinda Bailey, Syngenta Sustainable Farming Manager, said: “The on-going partnership with ASDA and Kings has demonstrated a practical and viable technique to both protect the soil structure and provide a valuable feeding and habitat resource for invertebrates and other farmland biodiversity. The Green Headland Mix is available to growers now at a Syngenta subsidised cost of £35 per hectare pack, subject to availability. Visit the website www.syngenta.co.uk for more information.